If you haven’t noticed, I don’t like spending money. I may work from home, but I work incredibly hard for the money that I have which means that I want to keep as much of it as possible. There’s a reason that I am so particular about which bank I keep my savings in and where I invest my money. I like my money. I want to keep as much of it as possible and I’m sure you do too. It makes sense then that when I started 2016 with a mindset to cut our expenses even more that I had in 2015, that I started looking again at where I could cut things again to save even more. What I ended up with was 30 more things that I simply stopped buying and started making myself. 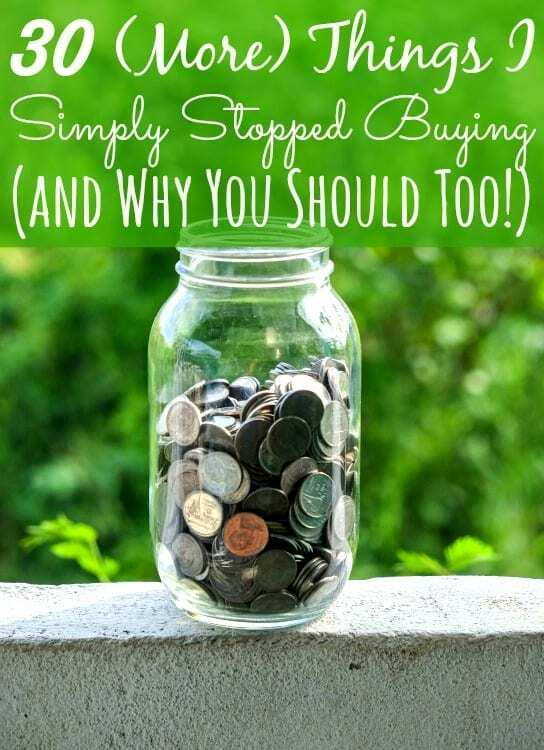 When I wrote the first post on 30 things I simply stopped buying and started making, we had just started our journey into living a more simple, more frugal and natural life. Financially it paid off in a huge way saving us $2500 in 2015 alone. These 30 “new” items have saved us $600 in the first four months of 2016. Making things homemade has honestly helped to save our budget, but we’re also living a much simpler life. We’re no longer reliant on going to the store to buy these things, we’re putting out less waste and we can’t see going back to buying these items anymore. In fact, you may someday see a third post on this topic here on the site because I’m currently working on adding even more products to our make ourselves list. I told you that we’ve saved $600 in 2016 so far so you might be asking how it would cost that much in 4 months (and I’m positive you are since I get asked that about the first post all of the time). Please let me explain how really quickly and then we’ll get into the new items on the list. I’ve long admitted that I pretty well stopped couponing. What that means is that yes, while I absolutely do look for a sale or deal on things, I am not always able to find them. In other words, a lot of the time I have to pay retail. I know. I’ll give you a moment to get over the shock from the idea of paying retail. Due to that, our grocery and household bills were through the roof and coupons or not, I won’t have it. It is much cheaper for me to make these items myself than it is to buy them at retail prices. Even a bottle of Suave body wash (which I get suggested to me every single day) is $2.02 with tax at my cheapest store. We go through 4 bottles a month since there are 2 of us that use the same body wash. Do the math on that please. $2.02 * 4 = $8.08 per month. $8.08 * 12 months = $96.96 per year (and that is assuming we don’t have company that causes us to use more which we often do). Do you understand now? $96.96 per year only on body wash. That’s the catch with buying commercial products. You think you’re getting a great deal. You’re very likely not and over the course of a year, that “great deal” will only add up over and over again. Apply that to every single item you buy, even those that you buy with a coupon and you are quite likely wasting a lot more money than you realize that you are. It doesn’t stop with just the immediate financial aspect for us though. We found out in 2015 that I react horribly to chemicals. I don’t mean that I break out in hives or a rash. I mean that I react in a way that causes my body to have debilitating muscle and joint pain with stiffness, horrid migraines, mood issues and more. My health had gotten so bad that I needed help showering…that I couldn’t raise my arms high enough to wash my own hair…that I couldn’t shave my own legs. I’m only 33 and I am incredibly blessed to have a husband who took care of me when I needed it. We were spending somewhere around $3,000 each year on doctor visits and chemical cocktail medications alone. I haven’t been to a doctor since we made the switch and you know what? I haven’t hurt since then either. In fact, the only time I get even a mild headache these days is when I go against what I know and eat something or use a product that I know is stuffed with chemicals. Not only that? The knowledge that I have gained over the last year and four months has enabled me to treat my diabetes naturally without really changing what I eat or being on medications. Finally, I want to address one more comment that I frequently get on the original post. Yes. You absolutely will spend $9.00 or so for beeswax. Yes, a bottle of essential oils might cost you $12.00. Yes, cocoa butter will run around $10.00. You will also get an incredible number of uses out of that $9.00 beeswax or $12.00 bottle of EO. Most of the recipes below and the others that I am aware of use a very small amount of each ingredient. If you buy a pound of beeswax for $9.00 and your recipe uses 1 tablespoon of the wax. You will get 32 uses out of that pound. In other words, you’ve only paid $0.32 for the beeswax in that particular product. You absolutely have to think about the long term when you’re figuring out cost vs. savings and if you don’t? You absolutely will cause yourself to spend more in the long run. Looking only at short term savings only causes you to fail at building wealth in life and I’m one-hundred percent sure that building wealth is something that we all want to do. and with that? Onto the list! Potatoes – Did you know that you can grow potatoes from the scraps of other potatoes? You sure can! In fact, potatoes are just one of a few foods that grow from scraps. While we haven’t seen any savings yet since ours are still growing, later in the year it will save us quite a bit. Plus, I know what was used to grow them and where they came from which is priceless to me. Dishwasher Soap – Dishwasher soap is on the original list, but I have tweaked the recipe a bit since I originally posted it. Instead of using lemon juice, the new recipe now uses Lemon Essential Oil and creates a thicker, creamier product that cleans and disinfects better than the original. Canned Tomatoes (or tomato sauce) – We use a lot of tomato products in our home so when we needed to move away from store bought, I picked up a pressure canner and started canning them myself. We can whole tomatoes and diced as well as creating homemade tomato sauce and homemade tomato paste too. The canning process is basically the same for whole and diced and I love that it gives me the ability to create different tomato seasoned blends like roasted garlic and herb or mexican seasoned tomatoes. Wrinkle Cream – Okay ladies. I’m only 33 but crows feet and laugh lines are starting to show. Instead of spending money on expensive wrinkle creams that my body wouldn’t like anyhow, I started using a homemade wrinkle cream instead. The vitamin E in the recipe is the kicker for wrinkles and the results are fantastic! Body Wash – Homemade body wash is on the original post, but as time went on I found that I missed having different scents like I was used to. What resulted was one that has been my favorite since I first tried it a few weeks ago. My new favorite, homemade Earl Grey body wash has been in my bathroom since I first saw the recipe. Air Freshener – As I said earlier, chemicals don’t react with my body well, but I love smelly good anything. Unfortunately, most air fresheners are full of the chemicals that my body hates so we had to learn how to make our own. What I found was that I love the ability to customize the scent while knowing that I’m using an all-natural product that works just as well. Dog Toys – I don’t know about yours, but our dogs can chew through almost anything and that includes dog toys! Even the ones that are supposed to be hard to chew through get puppy annihilated without too much work. To save ourselves money, we’ve started making our own DIY Dog Rope toy using scrap fabric and rope that we have around the house. It’s one of my favorite new ways to use old towels and it doesn’t really matter if they destroy it in under a week. Fire Starters – We camp a lot as a family. My Tom is great at getting a fire going without much work, but I always had to use those little fire starting bricks. Now, instead of buying them, I make these DIY orange peel fire starters and save the money I would have spent on those bricks. They’re easy to make and as a bonus? Less kitchen waste! Paper Towels – Paper towels can really be a budget killer and they’re so incredibly wasteful. Now when I need a paper towel, I grab one of the unpaper towels that I’ve started making. They’re not hard to make at all and in fact, I consider them a fantastic new use for old bed sheets! Cut your sheet into fabric squares a bit larger than you want your towels to be. Layer 2-3 layers of sheet to thicken your towel up and use your sewing machine to sew them together. Be sure to hem or otherwise sew the edges so that they don’t fray and cause you to lose your new unpaper towel. Liquid Laundry Detergent – I love my homemade powdered laundry detergent recipe, but it is hard for my Emma to measure it out correctly. We fixed that issue though by making a new homemade liquid laundry detergent that she finds much easier to measure out without wasting. Bleach – Bleach is a harsh, harsh chemical that I firmly believe should never be in any home. There’s not really a need for it. Lemon essential oil in your wash water with a bit of Borax can help whiten clothes naturally. If something is really yellowed and needs whitened, soak it in lemon juice and leave it out in the sun for a while. The sun and the lemon will do the same thing as a harsh bleach without the risk. Celery – Celery is another plant that will grow from scraps, but it’s a bit different than potatoes. It grows incredibly quick. I showed the success that we had last year when we first tried it out after just a week. We’ve been steadily growing our own celery from scraps since the beginning of the year and yes, we actually do go through quite a bit of it. I use it in a lot of recipes. Muscle Pain Relief – Buying things like Icy Hot or BenGay can be incredibly expensive if you use a lot of it. Instead, I started making this homemade muscle relief cream which works better, is all natural and so much cheaper! The best part? It’s safe for older kids so when my Emma gets hurt playing sports, I can use it on her too! Taco Seasoning – Taco seasoning packets are full of sodium, but this taco seasoning recipe isn’t. It tastes a bit different than you’ll be used to but it still makes amazing tacos! Floor Cleaner – Skip the expensive Swiffer and specialized high priced floor cleaners for something that is not only greener but cheaper as well. We stopped buying commercial ones and instead use my homemade floor cleaner. It costs me less than $1.50 per gallon to make and works like a charm! Soft Scrub – I love using Soft Scrub to clean my bathroom, but just being around it makes my throat close off. To keep that from happening, we stopped buying it and use this natural Soft Scrub recipe doesn’t and my bathroom has never been cleaner! Grout Cleaner – Grout can be hard to get clean but there’s no need to buy a cleaner for it. We’re making a homemade grout cleaner with just a few items and pennies on the dollar. Shower Melts – We all have really bad seasonal allergies at my house, but buying those Vicks shower melts was getting expensive. Instead, I’m not making these homemade allergy busting shower melts instead. They’re super easy to make and cost me less than $0.25 each tablet to do. Silver Cleaner – I love collecting random pieces of silver to use for home decor but what I don’t like is the cost of commercial silver cleaners. Now, I am falling back on an old method that I used to use before I got lazy and went to commercial products. My no-touch silver cleaning method works better than any commercial product I’ve used and uses nothing but water, foil and baking soda. Body Lotion – I have incredibly dry skin so I needed something that wasn’t full of chemicals but would deal with my itchy skin. My homemade body lotion does just that and since I’m the one making it? It can be any scent I want it to be which is a feature that I love! Body Butter – Body butter isn’t a necessity but chances are that you don’t want to have dry, rough skin. Instead of paying insane amounts for a quality body butter that works, I started making my own recipe. It is amazing on my skin and when combined with my homemade lotion (I use the lotion in the mornings and the body butter after showers), my skin has never been softer! Anti-bacterial Ointment – Neosporin is expensive and the stuff that most dollar stores sell isn’t quite as potent as it needs to be to take care of nasty cuts and scrapes. Instead, I was introduced to a homemade anti-bacterial cream that we LOVE! It’s amazing at healing and keeps infections away just as great as the “other” stuff does! Cleaning Wipes – Disinfecting wipes are crazy expensive for the number of them you get. Why pay $0.09 or more per wipe when you can make your own DIY cleaning wipes for a lot less per use? They’re washable, they’re reusable and? You can make them in any scent you want! Hand Soap – Hand soap is a must in any home, but especially one with lids. To combat the $1.50-ish price tag, we’ve started making homemade liquid hand soap. I cut the cost down even more by using my homemade liquid Castile soap to make it which means that I’m paying very little for each batch. Ranch Dressing – My Emma and Tom are huge ranch eaters and were going through at least a bottle and half a week. To combat the cost of even the cheapest bottle, we’ve added homemade buttermilk ranch dressing to our list. Granola Bars – Granola bars are another thing that we eat a lot of. Between sports and camping, road trips and more, they’re such a quick snack that it makes it easy for us to grab them but I can’t justify spending too much on them since they’re so easy to make. So needless to say, we stopped buying them and I’m now making my homemade oat and fruit bars to take instead. Diaper Rash Cream – I know. I can hear you now. “Stacy, you don’t have any babies.” Nope, I sure don’t. My only baby is growing up way too quickly. What I do have though is an 11 year old who because of sports, often gets heat rashes. My DIY Diaper Rash Ointment recipe is a great fix not only for diaper rashes but heat rash too. It saves me from having to buy anything to help soothe it and keeps her from getting ouchies. Orange Oil Cleaner – I love anything that smells like citrus so when I decided to start finding ways to reduce our kitchen waste and use it frugally instead, I knew I had to start making this homemade orange oil cleaner. It’s super simple to make and the cost? Less than $0.25 per quart. Furniture Polish – I can’t see spending $3.00 per can of furniture polish when I can make one from things that I already have here at home so we stopped buying it. A little bit of olive oil and a few drops of orange essential oil and bam! I have clean, shiny and cared for furniture. I use it on everything from Tom’s vintage bedroom set that is in our guest room to my antique dining room table that was built in 1902. Salsa – Salsa is another thing that gets eaten quite a bit around here and at $2.50 a jar for the cheapest around here, I can make homemade salsa much cheaper. Plus side? It tastes so much better than the store bought stuff. One other question I get asked often is how I manage to work full-time as a blogger, freelance on the side for other bloggers, homeschool my daughter and manage everyday life and still get all of these things made. We don’t make everything in one day and it isn’t just me that makes it. We all help out. We all have products that we make and we do it whenever we can fit it in. To us, saving the money that we do and not having a home full of chemicals is worth squeezing making these things ourselves worth it. Like Gayle I just found you site not to long ago and I just started to make homemade reusable dryer sheets. I tried lavender the first batch, but I didn’t like the way they smelled. So I gave it a try again and went with lemon. Lemon worked great. Nothing smells like vinegar. Not even our towels when they get wet. An other FIRE STARTER is save lint and put it in a toilet roll and then wrap news paper around it twisting the ends. I don’t go camping, but my friend does and I make these for her and she just loves these. Everyone knows that lint is very flammable. She says these work wonderful and when ever the fire dies down…you just toss one in. Lint and toilet rolls are free. Can’t beat free! The first thing I stopped buying years ago was paper napkins. I made some CLOTH NAPKINS using cloth remnants and just throw them in the washer with whatever load is going in next. They’ve held up for a long time. I even made some small ones that went into my kids’ lunch boxes. I just want to say I admire you and your story! I can relate to some of your history both as an individual and a child. I love what you are doing with your finances and it gives me hope for mine. I am putting much of these things into procatice to stop flushing money down the drain and spending on what I don’t need. Less is more! Congrats to you and your baby on finding success and happiness! Quick question: do you think the “diaper rash cream” would work for two guys who are having some…er…chafing issues, thanks to super hot days and sweaty clothes? I have a very similar back ground as you Stacy and am always trying to save. I have all boys, am disabled enough so I can’t work full-time but am not disabled enough to be able to get help. My one thing is free samples. I have been able to go months without buying shampoo and conditioner. The downfall is using different types and brands all the time. I rip up towels to use as paper towels and use them on the swiffer I have, It’s the dry one that you push the corners into the rubber slits on top to hold them on. I have recently had my grandchildren move in so laundry is horrid and am going to give your laundry soap a go. I make my own eye makeup remover for a few pennies. 4 oz of water, 1/2 teaspoon of baby shampoo and about 10-15 drops of baby oil. Give it a little shake before you use it. I am interested in the wrinkle cream recipe but the link goes to the healing lotion. Is that correct? Yes ma’am. Because it is Vitamin E based, it works as both a lotion and a wrinkle cream. I love your blog and am so glad to find it. Spending less money on STUFF means less working outside the home away from family and that’s what it’s all about I saw an article about all the things that “save us time” like dishwashers and rumbas and then a breakdown of how many hours we had to work to buy them, not to mention how much it cost to run then. As for me I would rather wash the dishes and sweep the floor. I love time with my family.